International health experts have called it the largest mass poisoning in history, and it is still underway. Some 100 million people in southeast Asia have been drinking from shallow wells originally drilled to provide germ-free water; but many turned out to be contaminated with naturally occurring arsenic. Despite efforts to understand the natural processes at work, and provide safer water, many are still being poisoned, due to scant resources, poor information at local levels, and the sheer numbers of people and wells involved. The result: a slow-burning epidemic of heart disease, cancers, lung problems and compromised child development. Researchers at Columbia University’s Lamont-Doherty Earth Observatory and the Mailman School of Public Health have been on the front lines of the issue since 2000. They are currently leading a wide range of initiatives, including long-term health programs, continued drilling of safer wells, education and continuing investigations into the geology of arsenic contamination. Arsenic is of course a classic poison known since antiquity. Inert, and thus harmless, traces of the element are locked into many rocks and sediments across the world. But starting in the 1990s, studies by scientists at Lamont and elsewhere have shown that under certain natural conditions, these may release the arsenic into drinking-water aquifers. Altogether, it is now estimated that some 140 million people in 70 nations are exposed to unsafe levels of arsenic in well water. Southeast Asia—Bangladesh in particular—is ground zero. 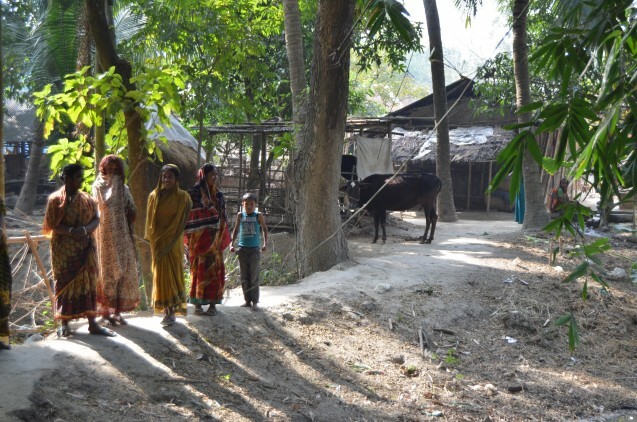 About 97 percent of Bangladesh’s rural population depends on millions of modest community and private wells. Nearly all water there is carried by hand, and most people live within 100 meters of one. By 1999, it was shown that half were contaminated. Some 33 million to 77 million Bangladeshis, or as much as half the current populace, have been exposed. The results: according to one 2012 Lamont study, one in 18 adult deaths can be attributed to arsenic. A 2014 Mailman study says the figure could actually be one in five. Many millions more are drinking from unsafe wells in India, Pakistan, Nepal, Cambodia, Myanmar and Vietnam. Other countries with widespread problems include China, Mongolia, Chile, Argentina, Mexico and the United States. Some 43 million Americans depend on mostly unregulated private wells; testing has shown that nearly 7 percent contain unsafe levels. According to the Environmental Protection Agency, 500 utilities in the U.S. provide drinking water with unsafe levels of arsenic. But determining how many people are getting too much arsenic in their water is difficult, according to a 2014 study conducted in part by the Columbia Water Center. 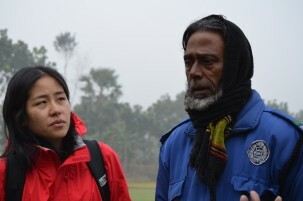 Before wells became common in Bangladesh and other southeast Asian countries, most rural people had to drink sewage-laced surface waters. In the 1960s and 1970s, the United Nations began systematically installing shallow wells in Bangladesh and other countries to provide safer water. It was a huge success; infectious diseases dropped, and other organizations, along with many communities and private parties, installed many more shallow wells. These were simple, narrow boreholes cased with plastic pipes, generally reaching down less than 30 meters. By the mid-1990s, 10 million were in use in Bangladesh alone. The problem caught entire countries unawares in part because arsenic is a stealthy poison. Ailments often take decades of chronic exposure to show up. Studies by researchers at Mailman and other institutions have linked it most strongly to cardiovascular disease, and cancers of the skin, lung and bladder. Mailman researchers have also linked arsenic to reduced IQ in children—a finding confirmed last year among schoolchildren in the U.S. state of Maine who have been exposed to levels only a tenth those studied in Bangladesh. There is also good evidence for many other cancers, increased stillbirths, diabetes, neurological impairments and immune ailments. 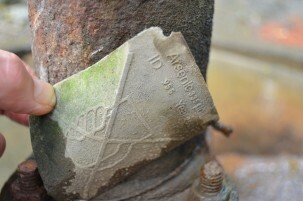 Labels help villagers identify wells with safe water. 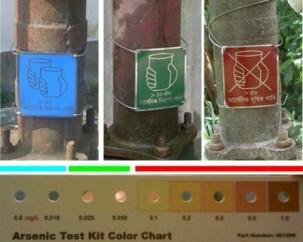 The World Health Organization standard is no more than 10 parts per billion of arsenic (blue); the Bangladesh standard is currently 50 ppb (green). 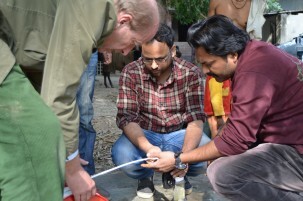 According to a 2013 study led by Lamont’s Alexander van Geen, the number of tubewells in the Araihazar district, just east of the capital of Dhaka, doubled from 2001-2012. Yet to compound the problem, there is evidence, says van Geen, that some newly drilled safe wells tend to cluster in politically favored districts, not according to need. The rapid expansion of deep pumping for crop irrigation may pose an even more serious threat; farming uses much more water, and such pumps are proliferating across India, Bangladesh and other countries. In addition, rice irrigated with tainted groundwater takes up the element. 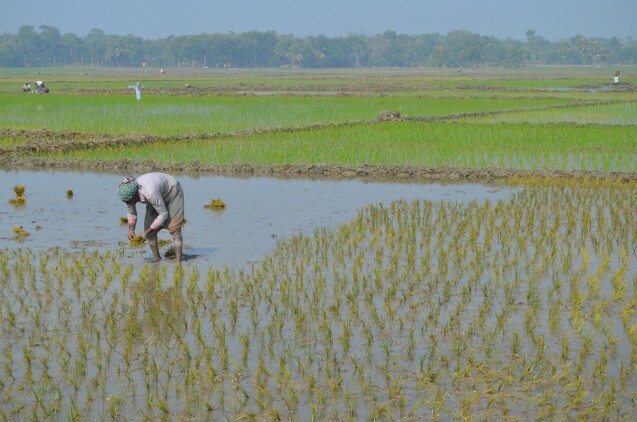 Arsenic has also been shown to lower rice production—in Bangladesh, maybe 6 percent a year, according to unpublished Lamont research. 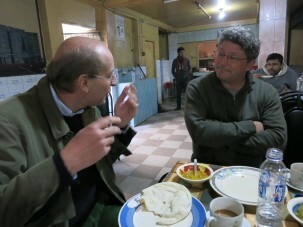 The Columbia efforts began in 2000 around Araihazar, a highly polluted area. It started with testing of 6,000 wells serving some 70,000 people, and the opening of a clinic to conduct long-term health-monitoring of 12,000 people using the wells. The researchers have since tested and labeled more than 50,000 wells, and the health monitoring study has expanded to include 35,000 residents. It is the largest longitudinal study of its kind, and has yielded many of the key results about the toxicity of arsenic. The clinic has since evolved into a four-building complex that also delivers basic health services and dentistry to the area. Employing 125 people, it has accumulated an arsenal of diagnostic tools—X-ray, EKG and ultrasound machines, and sophisticated equipment to test blood and take DNA samples. A dispensary hands out medicines at half-price. Workers at the clinic and back at the project offices in Dhaka compile reams of data for study, some of which goes into a new national registry of chronic diseases. 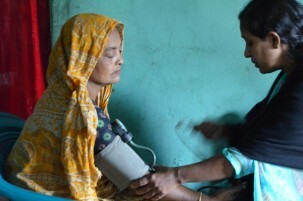 “Diabetes and hypertension are high here,” said Tariqul Islam, the clinic’s director. Out of the 35,000 participants in the long-term study, he said, more than 3,000 have diabetes, and more than 6,000 have hypertension. These could be tied to arsenic—but also to other problems such as diet, cooking smoke and cigarettes. 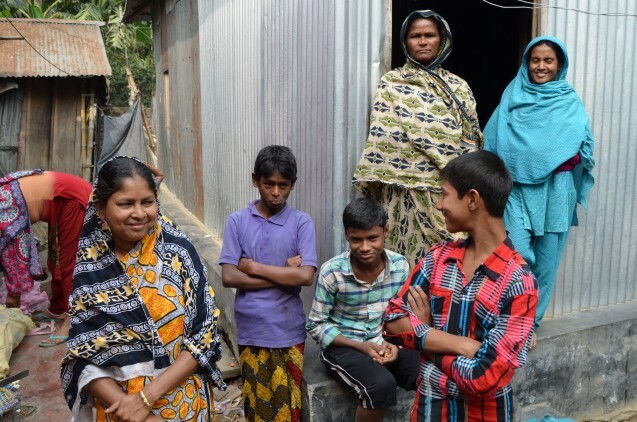 In the nearby village of Panch Baria, Tariqul visited with members of the extended Khondaker family, 27 of whom have health issues related to arsenic poisoning. Nasima, wife of the hamlet’s head man, said four family members have died from cancer, and her sister-in-law has lung cancer. 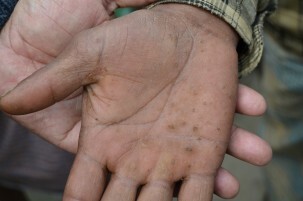 A relative showed the mottled skin on his chest, and another family member showed bumps and lesions on his hands– typical signs of arsenic poisoning. The clinic has enrolled 22 family members in a clinic trial to see if doses of Vitamin E and selenium can help alleviate symptoms. Another trial has shown that folic acid can help some people reduce the amount of arsenic held in their bodies. The clinic organizes village meetings to pass on information about arsenic and its symptoms, and to reinforce the importance of testing and using clean wells. Programs in public schools teach youngsters about avoiding arsenic in drinking water—and there is evidence the students have carried the lessons home to their elders. In the meantime, geologists and hydrologists from Columbia and other institutions are traveling around Bangladesh, testing sediments to better understand the source of the problem. 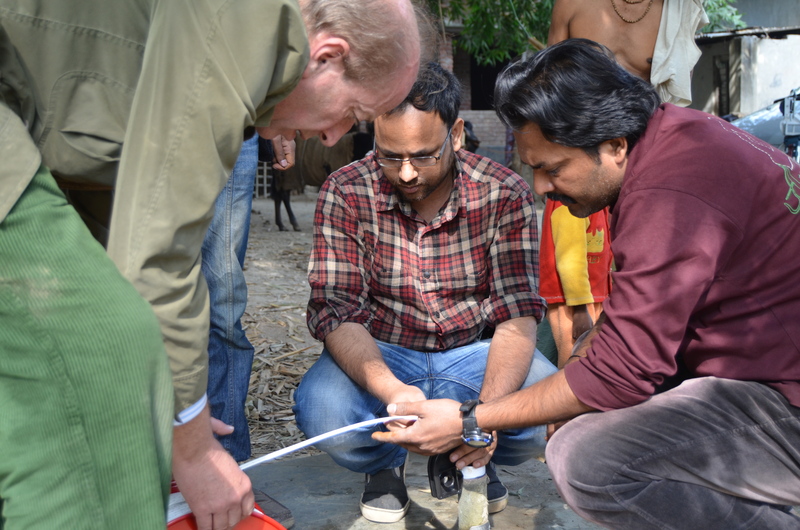 On a visit to the village of Bari Kandi, 25 kilometers east of Dhaka, the team tapped into eight test wells dug to varying depths to help researchers track how arsenic may be moving underground. The site is one of several set up a decade ago that are periodically retested. They want to find out how arsenic gets into the water, and whether the problem is getting worse or better over time. Brian Mailloux, right, an environmental scientist from Barnard College, and scientist Edwin Gnanaprakasam from the University of Manchester in England are trying to understand how bacteria release arsenic from sediments into groundwater. The researchers headed to a plot they have chosen for testing. They mapped out a corner near the spot where irrigation water enters the field, where arsenic concentrations should be high; and then boxed off a second corner far across the field, where arsenic has likely dissipated. The farmer who tills these fields is one of several who have agreed to swap topsoil between the two plots, to see if they can improve yields. 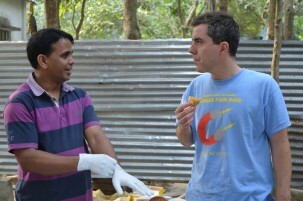 After the work in Faridpur last January, van Geen led a crew southwest to Jessore, near the border with India, for another experiment. Tests have shown that some deeper wells—supposedly dug to the safe aquifer level—have become contaminated with arsenic. Researchers from many other institutions are involved with Columbia in the health and earth-sciences research, including the University of Chicago, Massachusetts Institute of Technology, the University of Delaware, the University of Dhaka and Texas A&M University. The Columbia researchers also have ongoing related studies in eastern India, Myanmar, Cambodia, Vietnam and the U.S. states of Maine and Illinois. Funding for the hydrological studies and the health research comes primarily from the National Institute of Environmental Health Science Superfund Research Program and the National Science Foundation.